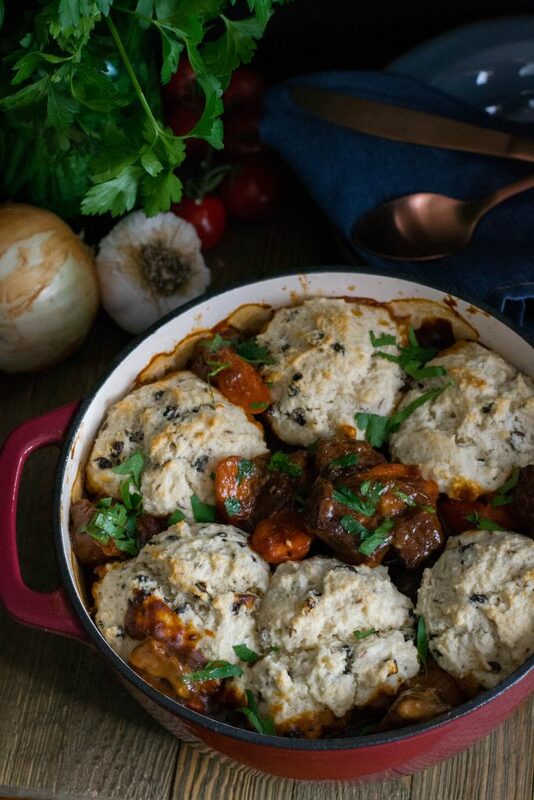 Guinness Beef Stew with Irish Soda Biscuits - What the Forks for Dinner? Sometimes combining two recipes and adapting them to your taste works out so perfectly. 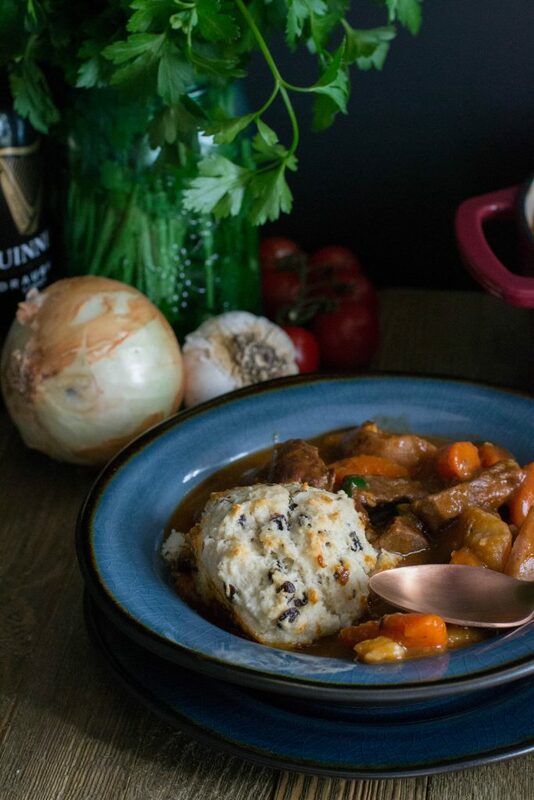 Guinness Beef Stew with Irish Soda Biscuits is one of those times. Gimme Some Oven had a beautiful looking recipe for Guinness Beef Stew, and while I changed it up from the original it was super delicious. And what can you say about Martha Stewart????? She has inspired me in so many different ways, her Irish Soda Scones caught my eye. I did make them as the original recipe called for, but used them in a savory dish and they rocked!!! 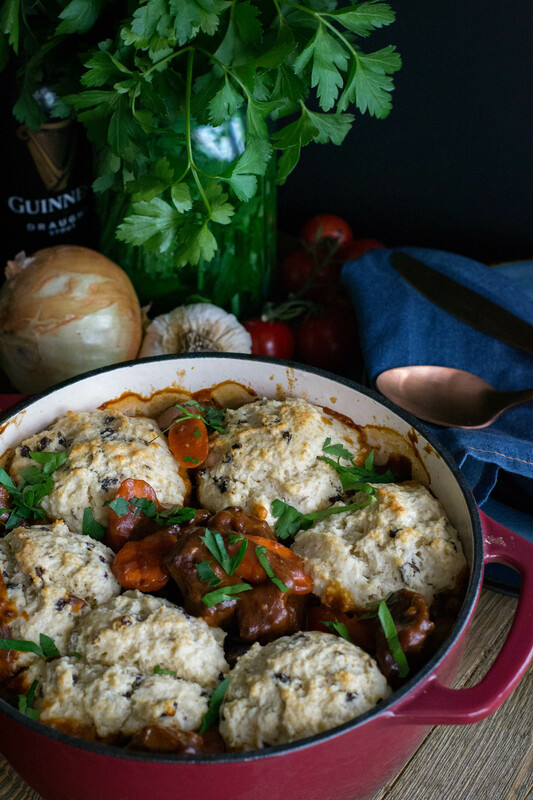 Guinness Beef Stew with Irish Soda Biscuits is a little bit Irish, a little bit comfort food, and a whole lot of yummy. Plus it’s a one pot meal, and who doesn’t love that???? Prep time for the stew is the hardest thing about this dish, and even that was pretty easy. Peel some carrots, half some baby potatoes, and chunk up a chuck roast. Cooking time….ready in a couple of hours. 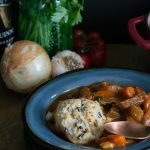 You could try a slow cooker or your Instant Pot ……. just adjust the time accordingly.For a slow cooker, brown the beef and cook on the stove top through adding the Guinness. Place in a slow cooker and cooker for 6-8 hours on low. For your Instant Pot, if your pot has a sear setting, brown the beef and cook through adding the Guinness on the sear feature. Add the remaining ingredients and cook for 40 minutes…. or as recommended by your brand of Instant Pot. If you do not have a sear feature cook on the stove top as with the slow cooker through the adding of the Guinness then transfer to the Instant Pot. I do prefer the stove top method for this stew. It makes adding the Irish Soda Biscuits easier. 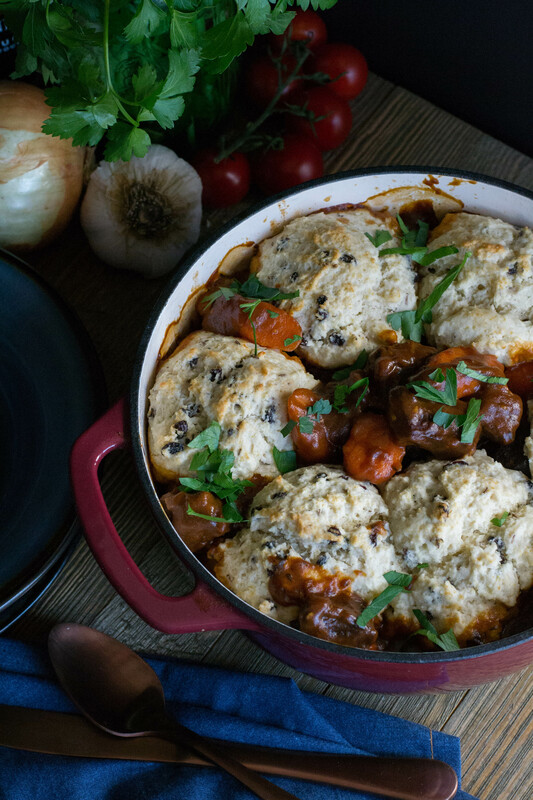 If you use a slow cooker or Instant Pot you will need to transfer the stew to an oven proof baking dish to drop the biscuits and finish in the oven. During the last 15 minutes of cooking the stew, prepare the biscuit dough. Preheat the oven to 425* degrees. 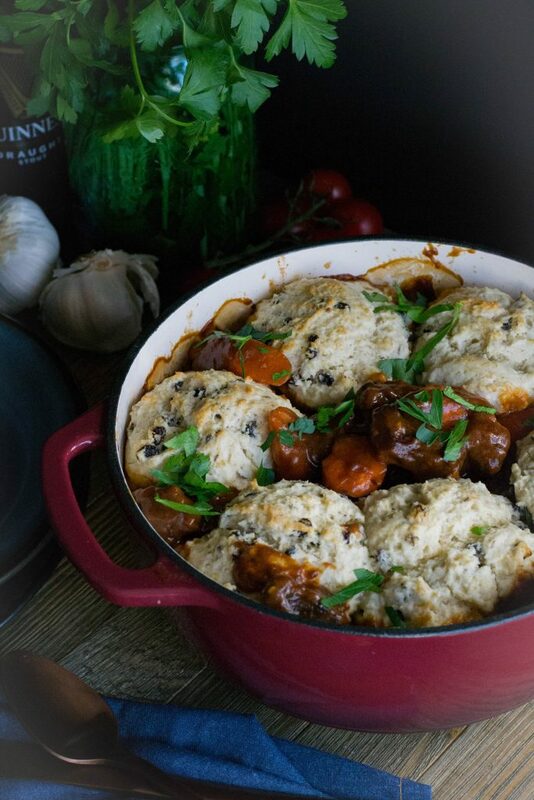 Scoop 6 biscuits using an ice cream scoop on top of the hot stew and bake in preheated oven for 15-20 minutes. A word on these as I call them biscuits……I really dislike raisins, currants(I used these) looked like baby raisins to me, plus I had to order them from Amazon, because I could not find them at my local grocery store. Let me say, I was pleasantly surprised by the taste. Smaller than raisins and made from a seedless red grape, they are sweet and slightly tangy. I may have to re-think my raisin aversion. Currant are most commonly used in baked products of the sweet variety, but they adapted well to a savory dish. 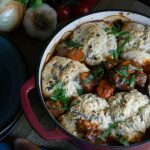 If you are looking for a comforting, one pot, with a bit o’ the Irish, try Guinness Beef Stew with Irish Soda Biscuits. Sprinkle beef chunks with salt and pepper. Heat 1 tablespoon of oil in a large stockpot over medium-high heat. Add about half of the beef chunks to heated, and sear, turning the beef every 30-45 seconds or so until all sides are browned. Remove beef chunks with a slotted spoon, and place on a clean plate. Add remaining 1 tablespoon oil to the stockpot, and repeat with remaining beef chunks, then transfer them to the plate as well. Add the onion to the stockpot, adding extra oil if needed. Sauté for 5 minutes, stirring occasionally. Add garlic sautéing for another minute, stirring occasionally. Sprinkle flour over the onions and stir to coat onions with flour cooking for about 1 minute. Gradually pour in the Guinness, stirring with a wooden spoon to scrape the bottom of the pan to loosen any brown bits. Stir in the beef bone broth, carrots, potatoes, tomato paste, bay leaf, thyme, and the reserved cooked beef, along with any juices on the plate. Continue cooking; when stew reaches a simmer, cover and reduce heat to medium-low. Simmer over low for 1 1/2 hours, stirring occasionally, until the beef is tender and the potatoes are soft. Prepare the Irish Soda Biscuits according to the recipe. Using an ice cream scoop, drop biscuit dough by the scoop around the side of the pan creating a circle along the outside. Place in oven and bake for 15-20 minutes or until the biscuit are cooked through and beginning to turn golden. Remove from oven and garnish with chopped parsley if desired. Whisk together flour, baking powder, baking soda, granulated sugar, and salt. Cut butter into small pieces; work into flour mixture with your fingers or a pastry cutter until dough resembles coarse meal. Add currants, caraway seeds, and buttermilk; stir until just combined. Finish as directed in the Guinness Beef Stew with Irish Soda Biscuits recipe in this post.